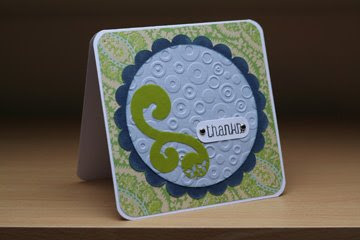 Another Thankyou card using K&Co papers, (got to use all those pads up!) scallop circle and inner circle cut on Craft Robo and embossed with Spots and Dots folder, tag cut from the Tiny Tags die set, and I used the font from Banana Frogs Paperchains set to stamp on the tag. 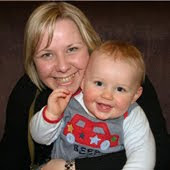 Have got an idea in my head for some Christmas cards too, must get on with those! Happy Birthday Me! 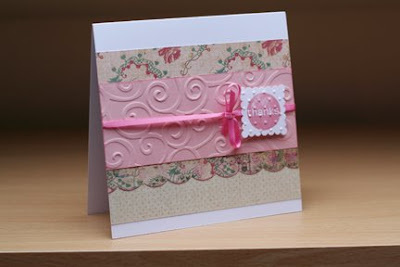 A bit late though - it was last week, but I am now the owner of a Cuttlebug so I have been trying my hand at making some cards this week. 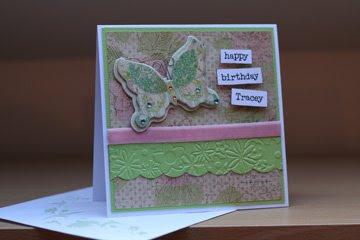 I can only show you one so far as I gave it to my Mum and Dad last night so I won't be spoiling the surprise, LOL! 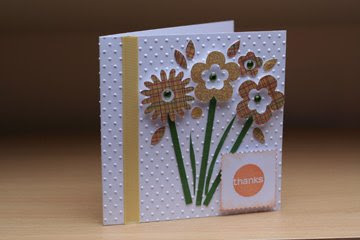 It's just a little thank you card for my birthday present, I have used some K&Co papers, the D'Vine and Swiss Dots embossing folders, Cuttlebug scalloped square die, and the "Thanks" stamp from Banana Frogs Flowery Thoughts set. Speaking of Banana Frog, there have been some changes over there! The Banana Frog website is now trade only, but you can find a list of suppliers here. Also, the search is on for some new Design Team members, you can find all the details here. Come and join us, you have plenty of time to get your entries in, the closing date is 31st December. Good Luck!